International TESOL and TEFL Training (ITTT) – ITTT is who I personally used to become TESOL certified when I was teaching in Korea. They provide a full range of certification programs to meet the needs of teachers at different phases of their careers. 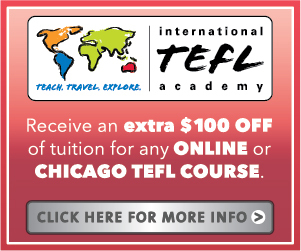 One of the more popular programs is the 120 hour TESOL certification done online. They also offer an in-class module as some employers are seeking this element. I did my certification all online (no in-class module) and chose to have a tutor review my work prior to signing off on each assignment. My ITTT certification served me well during my job hunting endeavors. If you are interested in a fully immersed, in-class experience, ITTT offers these courses as well at various locations around the world which is convenient for those already teaching abroad. Visit ITTT via my site and receive a 20% discount off tuition for any program you choose. International TEFL Academy (ITA) – ITA is another well-known, reputable source for TESOL/TEFL certifications. They have multiple programs to choose from based on the direction you want to take, including online certifications with an in-class component. ITA delivers their courses in a thorough, professional manner through a portal much in the style of a university degree earned online. Your work is reviewed by highly qualified professionals in ESL-related fields. All students and graduates receive lifetime job search guidance and alumni are currently employed as teachers in more than 80 nations in Asia, Europe, Latin America and the Middle East. Visit ITA via my site and receive an extra $100 USD off tuition for any online course.